This weekend, I had the pleasure of taking the kids, with the other half, to Hadleigh Country Park to do a bit of cycling. 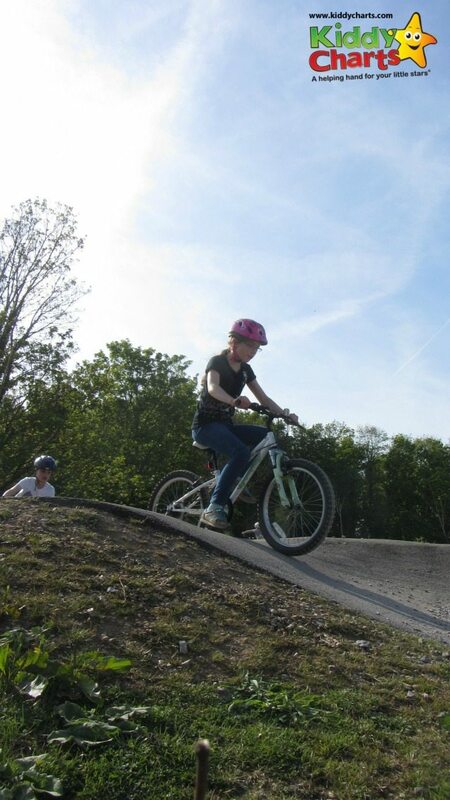 They have the Olympic Mountain bike track there don’t you know…. As you can see, we have a wonderful time. I really wanted to create something with my kids that reminded up of the day, but only using really simple bits and bobs. This would also serve not only as a great way to capture the memory, but also a wonderful Father’s Day present for my cycle mad husband. This was just right for the Bostik challenge and the craft materials that Craft Merrily had sent to us for the month of May. 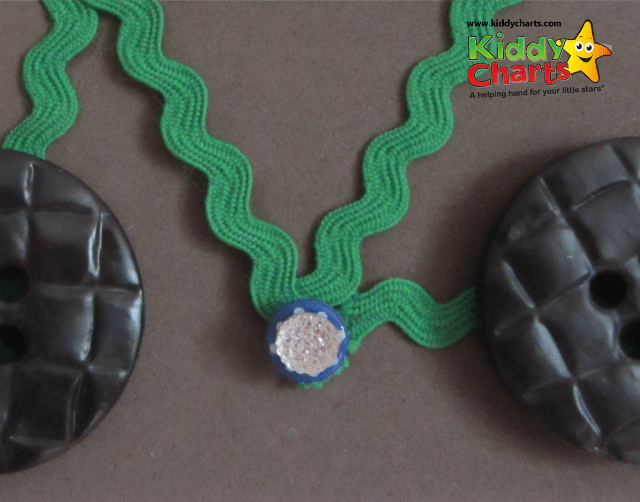 So Fathers Day craft – here we come! We decided that we were going to create a canvas of a bicycle using ribbon, buttons, craft tape and a few little embellishments that I had already in my crafty drawers. What do you think? 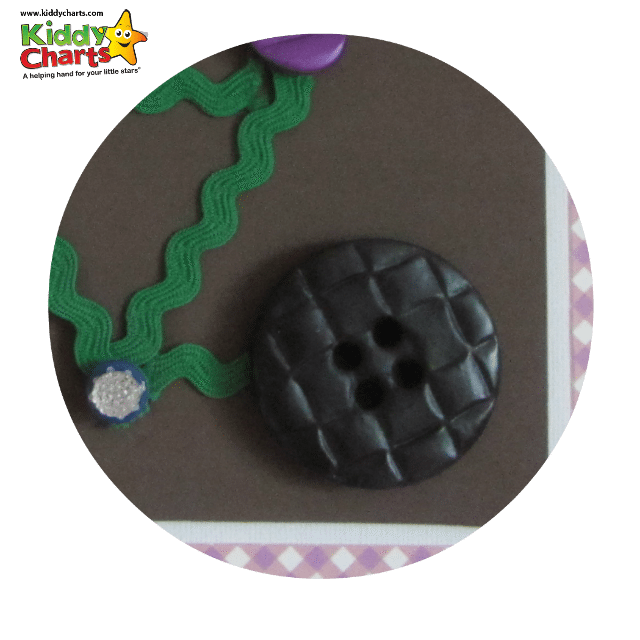 As with all the crafts on the blog, it is really easy to do, so why not give it a go? Sticky letters – we used a T and a J! Line drawing of a bicycle – we used the one here, but find one you are happy with and use it to guide you and your kids!. 2. 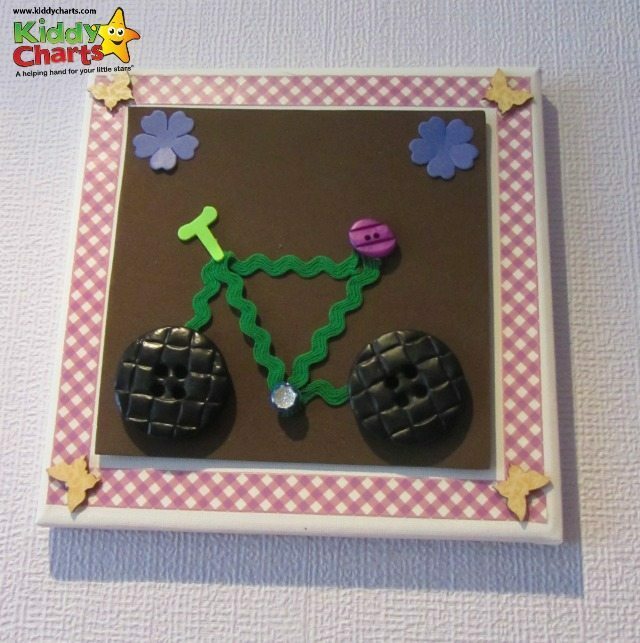 Place your wheels for the bicycle onto the foam, using your sticky pads, then remove them again! They should leave small marks on the foam as guides so you know where you need to put your ribbons. The does require a little bit of accuracy, but if your kids don’t have the patience, don’t worry about it – you will just get a slightly wonky bike! 5. Add your oval button to just overlap your ribbon where all the strips meet at the top of your bike over your back wheel – this is your saddle. We used another foam pad to stick this down, giving it a further 3D effect. 6. You now need to add the handlebars over your front wheel. You could use more ribbon for this, but we rather liked the idea of using a foam letter, so we went with the T! You could use a J to make yourself a racing bike, rather than a mountain bike ;-) Clever, huh? 7. Now you can decorate you canvas frame however you like, we have framed it with craft tape, and added a few wooden embellishments that go with our trips to the country park; a few butterflies. You will want to put something in the space about the bike though, as otherwise it looks a little stark. I hope you like this, and that if you do decide to give it as a Father’s Day gift, so does Dad. I am pretty sure my other half with like it – something made by the kids about a particular event has so much more meaning don’t you think? Nice Post.. Thank you for sharing.